Dortmund - Three games without a win, already as many defeats as the whole of last season and a 14-point deficit to make up on Bundesliga leaders FC Bayern Munich: it's not quite the Christmas reigning champions Borussia Dortmund were hoping for. For all their world-beating efforts in the UEFA Champions League, Saturday's 3-2 home reverse to VfL Wolfsburg has left Jürgen Klopp's faltering charges needing a New Year´s miracle. "The team played one of their best home games ever, but the red card changed the game," bemoaned Klopp in reference to Marcel Schmelzer's 35th-minute sending off at a point when Dortmund were already a goal to the good. "You have to credit the guys for coming back to level at 2-2, but then they get the third. That's really hard to take," added the 45-year-old coach. The stats only serve to reinforce Klopp's general assertion that his men were the better side, with Dortmund having 21 shots on goal to Wolfsburg's seven - the same number of attempts goalscorer Marco Reus managed alone. "Going a man down really didn't help in a game we'd dominated [before the sending off]," said Dortmund director Michael Zorc. Their third defeat of the campaign, Saturday's loss leaves the champions with only one home win in their last five Bundesliga outings (two draws, two defeats) - and against bottom club Greuther Fürth at that. 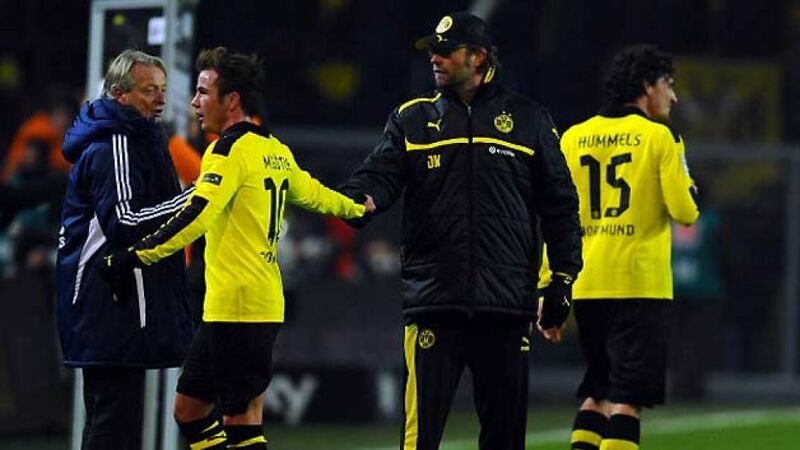 As well as only losing thrice in the league last term, Dortmund never went more than three games without a win. There is a case, then, to argue that Dortmund’s penchant to attack with such relent is proving their downfall defensively, but at the same time they had little option but to go for the jugular following Schmelzer's red card, even if that meant leaving themselves massively exposed to in-form Wolfsburg duo Diego and Bas Dost. Still, Dortmund's high-pressing game has been the foundation of their success in recent seasons. Bayern, for example, have had no answer to such an approach, having last beaten Dortmund in the league back in February 2010, while Real Madrid were largely outplayed when the two sides met in the group stages of the Champions League recently. If Dortmund are to make a fist of things at the top, they will have to stick to what they know best, and that's playing exceedingly good football. Let's not forget, the champions made light work of Bayern's eight-point lead last season and if anyone's going to get anywhere near the league leaders before the season's out, it's Dortmund.